November is marked with memorial services for those who gave their lives in two World Wars. London’s Cenotaph is the most well known memorial, yet throughout the country nearly every village, town and city has a church plaque or monument inscribed with the names of fallen heroes. Coseley Urban District Council’s first official war memorial was an inspired tribute. 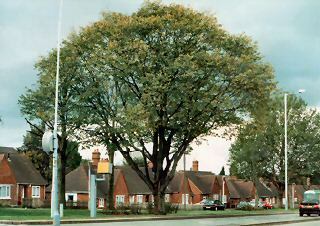 Both sides of the Birmingham New Road were planted with trees – one for each life lost in the First World War. An oval shaped metal plate carried the dead serviceman’s name and the sapling was caged for protection. This Avenue of Remembrance, one of the first of its kind, was dedicated on May 21st 1928. Today only a handful of the original 350 trees remain. Matt Mill’s photograph shows one of the 80 year-old specimens, [Beech or Wych Elm? ], in Lanesfield, between Hill Avenue and Ward Grove. Once again the falling leaves of autumn are a poignant reminder of the toll of warfare - lest we forget. A fine historical photograph of the dedication of the war memorial can be found on Ian Beach's Sedgley Manor site here.